This week was one of the roughest as I got some sort of stomach bug (ugh!) and my right hand/arm was sore from cutting coconuts and receiving a shot (hah) but checking the presale at Nordstrom made it a little bit better in preparation for their Anniversary Sale! I didn't find a whole lot this year, but I definitely bought some key pieces I'm excited to wear this year. I may still pick up a few other pieces and I'll either add them here or create a whole other blog post! I've also styled the pieces so you can get a better look at how they are on. The sale officially starts in less than an hour PST so I wanted to get this post up ASAP! 1) I only picked up two pieces from the sale and one of them was a jacket. I almost always go for jacket of some sort of jacket each year and this time I picked up this BLANKNYC Own the Night Bomber Jacket. It's so "me" and I love the varsity school jacket vibes from it. I have something to this already, but this jacket is more structured and in this cool gray color. I paired it up with these Nike Air Max Thea Sneakers seen in the photos above and I love the gum bottoms! I haven't had a pair of sneakers with gum bottoms since my Nike Dunks phase and I love how they look with the black and white. 2) This next outfit is paired with another top and shoes form the sale. I love oversized knits and I actually saw a ton that I liked, but ended up coming home with this one. This BP. Cold Shoulder Tunic Sweater in this burgundy color instantly caught my eye (plus purple shades are my favorite) and the slits on the arms add a nice touch. I've been loving slits and open shoulder tops for the summer and can't wait to transition the look in to Fall. Here, I paired the sweater with a pair of black faux leather pants I've had in my wardrobe and then these Louise et Cie Jianna Stacked Heel Pump in Black Suede also from the sale. They also come in this beautiful pink shade but it didn't look right on my skin tone so I had to pass. I love the classic black look though, and how these shoes fit. I have been on the hunt for a pair of black heels with a chunky heel minus the ankle straps and these ones fit all the criteria I had. Plus, they're easy to walk in! 3) The last item I picked up was another pair of sneakers, this time more trendy. I'm a sucker for sneakers and I have always loved velvet (I have a few items still from years back!). These Gentle Souls Carole Zip Sneakers in Navy Velvet instantly caught my eye with the dark royal blue color. I wanted to add that soft velvet look to other parts of my wardrobe and these shoes fit the description perfectly. The dark color will also help it not look as dirty! For these photos, I just paired the shoes with a simple black maxi and a white tee. 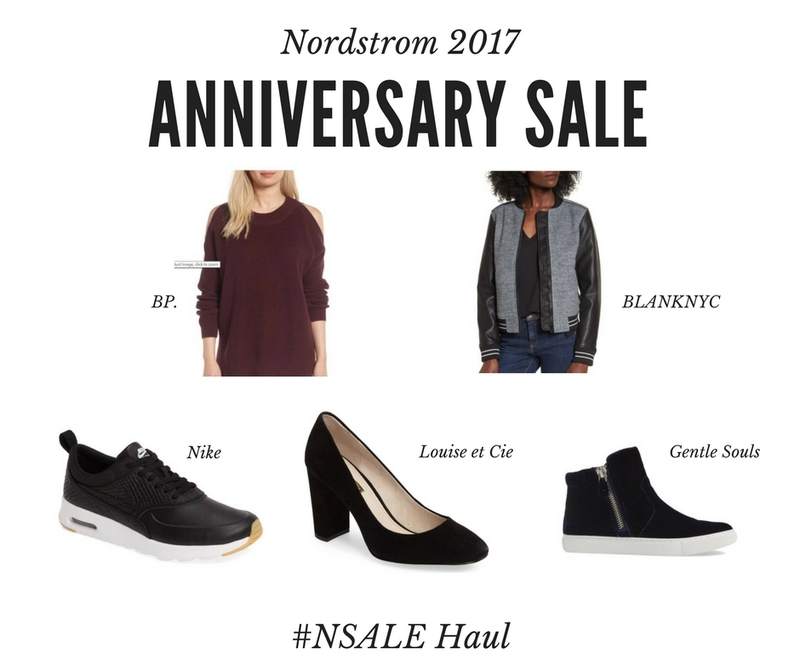 That's all I picked from the Nordstrom Anniversary Presale and I hope it gave you guys some outfit inspiration! I'll be sharing more looks with the pieces as I have time to shoot and if I do end up getting a few extra pieces, I'll share those as well as mentioned before! Did any of you guys shop the NSALE? Anything you think is worth getting? Let me know!